The International Monetary Fund is warning that dangerously low inflation could put the global economic recovery at risk in 2014. The IMF on Tuesday upgraded its 2014 forecast for economic growth in the United States and most other major developed economies. 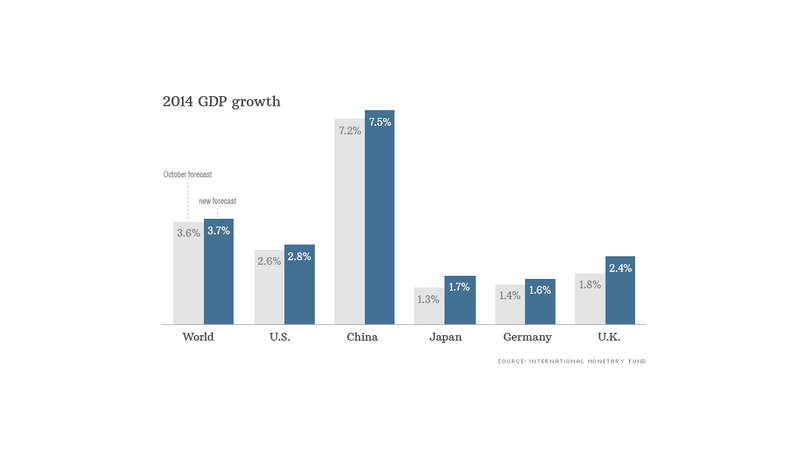 Global growth should accelerate to 3.7% from 3% last year, thanks to the recovery in advanced economies. That's a slight increase from its October projection. But it rang alarm bells about low inflation. "Risks to activity associated with very low inflation in advanced economies, especially the euro area, have come to the fore," the IMF said. A negative shock to the economy could turn low inflation into deflation, which risks a downward spiral of activity as consumers postpone spending in anticipation of cheaper prices in the future. The U.S. should grow by 2.8% this year, up from 1.9% in 2013, as strengthening domestic demand gets a boost from smaller spending cuts as a result of the recent budget deal. Recovery from recession in the eurozone will remain uneven, the IMF said, raising its forecasts for growth in Germany and Spain, but trimming Italy and leaving France unchanged. The European Central Bank cut interest rates in November after inflation sank to 0.7%. ECB President Mario Draghi said earlier this month that he's ready to use all the tools at the bank's disposal should prices take another turn lower. The biggest upgrade to the IMF's October forecast was for the U.K., where cheap central bank money has helped drive a sharp recovery in consumer and business confidence. Japan will also do better than expected, with growth seen broadly unchanged at 1.7% as a temporary fiscal stimulus package offsets the impact of a rise in consumption tax. Emerging markets should grow on average by just over 5% in 2014, up from 4.7% last year. But the headline forecast is unchanged since October and reflects a mixed picture. The IMF has upgraded its China forecast to 7.5%, while cutting its projection for Russia to 2% from 3%. Growth in Brazil should come in around 2.3%, unchanged from 2013. Stronger global growth is beginning to feed through into job creation but not fast enough to keep pace with the growth in the labor force. The International Labor Organization said Tuesday almost 202 million people were unemployed in 2013, an increase of almost 5 million over 2012. East and South Asia accounted for most of the increase. The World Economic Forum, which hosts its annual meeting in Davos this week, has warned that rising inequality and unemployment are two of the top three risks the global economy faces.